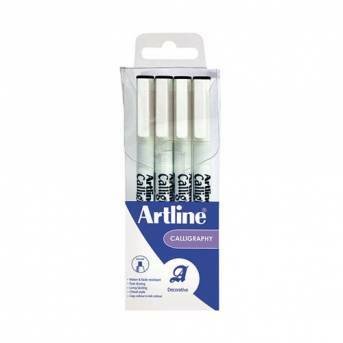 These Artline Calligraphy pens contain vibrant water-based pigmented ink, which is acid free and odourless. The ink is also quick drying, smear and fade resistant, and designed not to bleed through paper for a professional finish. Each pen features a metal ferrule to protect the nib. This set of 4 calligraphy pens contains 1.0, 2.0, 3.0 and 4.0mm nibs, all with black ink.